Back in the dark forgotten history of Cascadia, soccer used to be a pretty big thing around here. In the first decades of the 20th century, there was a thriving local soccer culture. There were several clubs in Seattle and the surrounding towns, especially logging or coal towns dotted around the cities. The Post-Intelligencer Cup was won by the Seattle Celtics; Tacoma was second, Carbonado third, and Black Diamond fourth and last. These teams and the Seattle Rangers and Woodland Park clubs competed for the McMilan Cup. Both cups are played for in the league system. The McMilan Cup competition was a seesaw affair from the beginning to the end, and the winner was only decided after the last game had been played. The Tacoma team finished ahead of the Celtics by one point ; Black Diamond, Carbonado, Rangers and Woodland Park followed in the order. Boy, lifting the knockout tournament cup, but missing the league title by one point to Tacoma? Ugh. I feel for the Irish today. 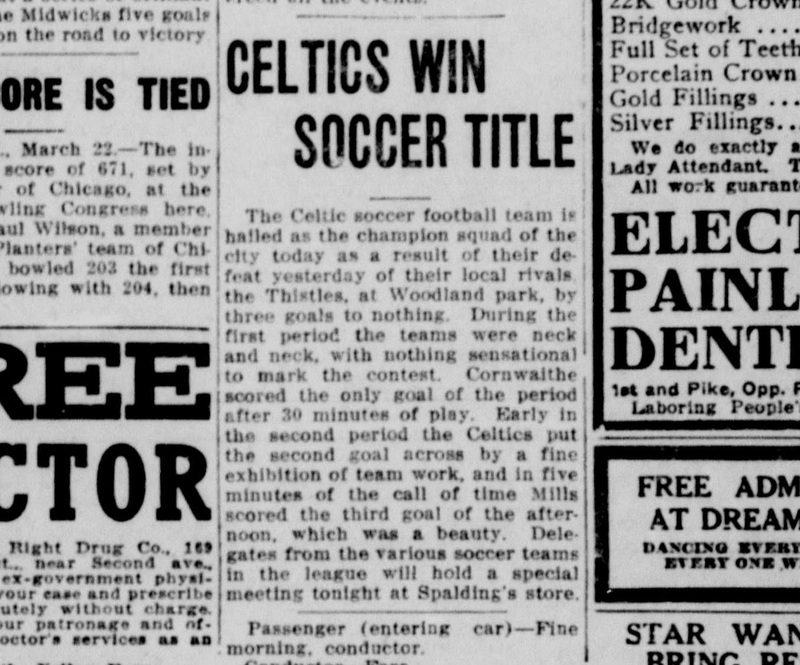 Mostly because I assume the Celtic brand is a powerful one (that goes way further than the borders of Glasgow), there is a Seattle Celtic club still.